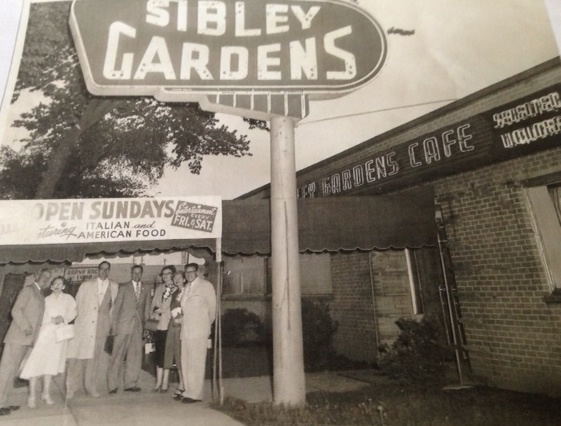 1935 saw the beginning of Sibley Gardens, located across the street and slightly north from its present location. In 1944, Sam (Severio) and Mary Piunti purchased the restaurant, and in 1949 moved to a new building on the west side of Jefferson Ave. resulting from the expansion of McLouth Steel. Though Sam and Mary owned the building, other owners came along in the early 1950’s to operate it as Sam went to open Sam’s Tavern in Wyandotte and Mary was the chef at Wyandotte’s North Shore Club. In 1961, Mary and her son Sam got back into the business and built it to be the landmark restaurant of the downriver area. Mary ran the kitchen while Sam took care of the front of the house. Mary’s recipes continue today and Sam is still active in the business six days a week at 84 years young! Pam Piunti takes care of updates in the look of Sibleys while Sam’s son Nick is the general manager. Sam’s grandson Jake is leading the fourth generation of Piunti family members to work either part or full time. Andrea Papp has moved on to spending a lot of time on the golf course but she was instrumental in countless updates to Sibley Gardens menus over the years and we continue to serve some of her specialties. 2016 has proved to be one of Sibley Gardens’ busiest years ever! A commitment to quality food, an extremely talented kitchen staff and experienced servers who quickly learn our guests preferences have resulted in Sibleys being “better than ever”. One of our goals has always been introducing our restaurant to new diners and welcoming the next generation of customers with open arms. At first visit, the drive down Jefferson Ave. may seem like an unlikely location for a restaurant of our caliber, but once inside our comfortable interior, the time tested menu and expert service is immediately apparent and so many first time guests soon become regulars. Whether it’s one of our house specialties such as Steak Sammy, Sonoma Chicken, Butter Crumb Cod or our ever changing daily specials, there really is something to please any palette. We hope to see you soon!